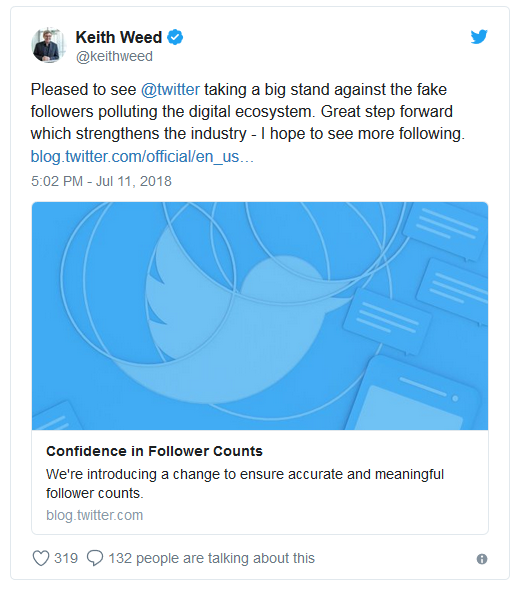 Unilever’s chief marketing and communications officer Keith Weed has commended Twitter for taking steps to eliminate fake accounts on the social platform. His comments are in response to Twitter’s recent decision to remove locked accounts from follower counts across profiles globally. Twitter locks accounts when it detects sudden changes in account behavior, like tweeting a large volume of unsolicited replies or mentions. Until now, those locked accounts remained in follower counts, but moving forward they will be removed. The move comes one month after Weed expressed his concern over the issue of follower fraud at Cannes Lions. At the festival, Weed said Unilever will no longer work with influencers who buy followers and encouraged the industry as a whole to do more to curb the issue. “The key to improving the situation is three-fold: cleaning up the influencer ecosystem by removing misleading engagement; making brands and influencers more aware of the use of dishonest practices; and improving transparency from social platforms to help brands measure impact,” Weed said at the time. How do I Know if my Online Ads Work When 90% of my Sales are Offline?